When you have a leak around your shower tray or it's gone black and mouldy you need a new Shower Tray Seal. Byretech design, manufacture and supply a clever range of Shower Tray Seals for all types of shower trays. We now do Vertical Seals to match too, so you can get your shower watertight. They look great, work extremely well and there are now in excess of 100,000 in use in the UK alone without problems. Easy to fit and coming as a complete kit, the ShowerSeal Ultra 10 products are guaranteed to keep the mould away for 10 years and seal the tray in perfectly ! We have various sizes available for you to choose from too. To show how easy they are to fit we have made a step by step video to help you. The seals can be retro fitted and are made of solid plastic, so unlike the hollow under tile seals from the Tile Shops and DIY Outlets, they don't trap water in and they don't go black and mouldy - That's Guaranteed ! 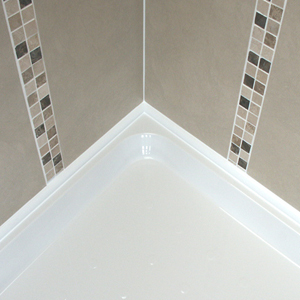 Byretech's Shower Seals are gloss white and are easily cut to size. We profile one end to make fitting extremely simple and even the sealant is included in the kit too. We supply Homeowners, Hoteliers, Housing Associations and even Formula 1 Teams use our Seals. Some of the UK's best hotel groups specify our seals as standard for their bathrooms.